Sleep is a beautiful thing. As soon as your head hits your pillow, your brain and body kick a number of essential processes into gear. Growth hormone is released, making you taller(1). The immune system is bolstered, protecting you from disease and infection(1). Memories are consolidated, making damn sure that you remember every word of tomorrow’s big speech(2). Anyone who has ever had to pull an all-nighter can attest to sleep’s importance (including NeuWrite’s Kerin Higa, read her article on sleep here). So, when something gets in the way of our recommended 8 hours, it is medically treated and dubbed a “dyssomnia” – a disorder that affects our ability to fall or stay asleep(3). Whether the problem is insomnia (inability to fall asleep), sleep apnea (abnormal breathing patterns that inhibit sleep), or another dyssomnia, millions of dollars of NIH funding goes to combating these disorders every year(4); our sleep needs to be protected. But maintaining a sleep state is only half the battle. What about the things that go wrong during sleep? After all, sleep is not all rejuvenation and sweet dreams. It can be riddled with unpleasantries ranging from unconsciously grinding your molars (“bruxism”) to raiding the fridge while dozing (“Sleep Related Eating Disorder” or “SRED”) to the phenomena commonly known as sleepwalking (“somnambulism”). Such issues are called parasomnias, or inappropriate behaviors, movements, and emotions that occur while we sleep(5). These issues, less understood and far stranger than their dyssomnia cousins, are the focus of some pretty fascinating neuroscience research. As there are 10+ distinct parasomnias and limited words I can type before you yourself fall asleep, I will focus only on two. The common theme? REM muscle atonia, a.k.a. muscle paralysis during REM. Sounds scary, doesn’t it? Surprising as it may be, though, REM muscle paralysis is not in itself a parasomnia. In fact, it is a totally normal and even essential part of REM sleep. During rapid eye movement (REM) sleep, the brain is a flurry of activity, making it a state that is (neural-activity wise) more like being awake than REM’s counterpart slow-wave sleep (SWS)(6). With all of this neural activity in your brain, it would be all too easy for your motor cortex (the movement center) to become accidentally activated; combine this potential for movement with the fact that dreams typically occur during REM and you could get a not-so-restful REM sleeper. To protect your sleep, a region of your brain called the subcoeruleus nucleus (SubC) becomes active during REM sleep, which in turn activates an area deep in your brainstem called the ventromedial medulla (VMM)(7). VMM neurons will then send inhibitory neurotransmitters (chemicals that make neurons less likely to fire) to skeletal motoneurons, the neurons that activate muscles and cause movements. The result is an immobile REM sleeper; once SubC turns on other features of REM (such as vivid dreams), it simultaneously turns off your ability to voluntarily move. Only your darting eyes and your breathing muscles can move during REM. Well played brain, well played. Diagram of the neural circuitry that may cause REM sleep paralysis. Contained within the red box, the circuit begins with the subcoeruleus nucleus (SubC) activating the ventromedial motoneurons (VMM, here MM). VMM will in turn inhibit motor neurons, effectively silencing all movements during REM. This VMM-mediated inhibition overrides the usual activation of motor neurons from other brain locations (such as the locus coeruleus [LC]), ensuring a restful night. The brain, however, is not perfect. In certain unfortunate individuals, SubC neurons don’t do their job correctly and fail to hit “off” on the voluntary movement switch(7). When that person enters REM, they will act out what they are doing in their dreams. Think about a puppy on its side, swaying its legs back and forth; you may assume the puppy’s dream is about running, and so is attempting to run while napping. However, in people with impaired REM muscle atonia (called “REM sleep behavior disorder” or RBD), the actions are nothing like this cute, innocuous example. For whatever reason, the person often acts out violent or frightening dreams, ones that often involve an immediate threat. This leads to an unconscious person who shouts, runs, punches the closest object (in the most frightening case, their spouse), and even jumps out the window, all depending on the contents of their dream(8). But why? What is causing RBD patients’ SubC neurons to neglect their muscle-paralyzing duties? As this question involves understanding sleep’s neural mechanisms (one of the biggest mysteries in the field of neuroscience) and investigation is mostly limited to human subjects, making progress has been difficult. Recently though, scientists have gotten a pretty good clue from imaging the brains of RBD patients using MRI. 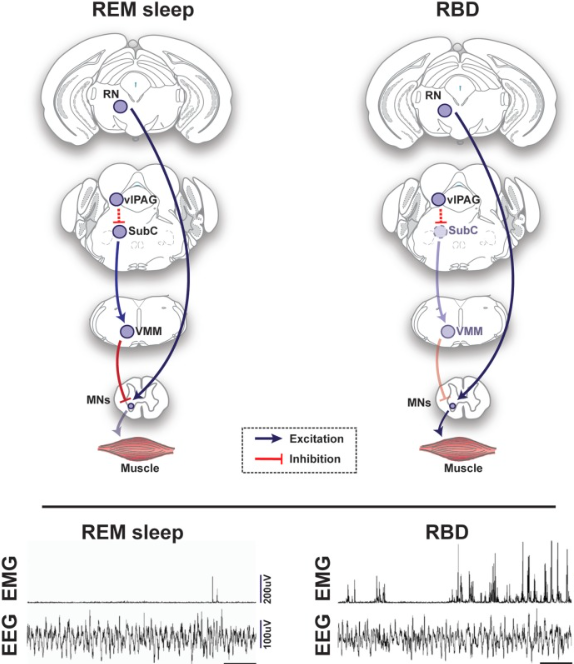 The REM sleep circuitry (in particular, the brainstem’s VMM neurons) seems to be consistently damaged in RBD patients; damage of the SubC-to-VMM connection could potentially lead to impaired REM sleep paralysis, resulting in RBD’s problematic symptoms(9). John Peever’s lab at the University of Toronto took mice with a severely decreased inhibitory neurotransmitter release onto muscle (replicating the effects of SubC-to-VMM damage) and looked at their movements via EMG after they fell asleep(10). These particular mice moved a significant amount during the normally immobile REM state (yes, mice experience REM sleep too! ), adding credence to the possibility of RBD-causing REM circuit damage. These mice were also successfully “treated” for their RBD-like symptoms by administration of medications typically given to humans with RBD (such as the benzodiazepine clonazepam, which makes the inhibitory neurotransmitter GABA more powerful(11)). 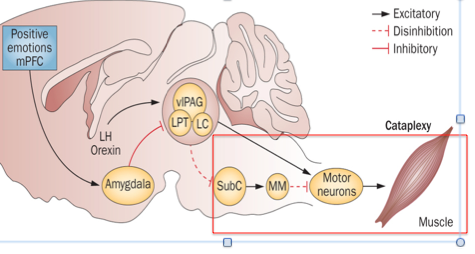 In RBD, the SubC neuron-VMM neuron connection may somehow be degraded. This would result in inappropriate muscle movement during sleep (as depicted by the spikes on the right electromyogram [EMG]), as compared to the stationary and stable sleep of normal individuals (shown by the lack of spikes on the left EMG). So, recent evidence may point to neurodegeneration of the REM sleep circuitry as cause for RBD. Intriguingly, ~40% of those with RBD will eventually develop Parkinson’s disease(12), a well-studied neurodegenerative disease where dopamine-releasing neurons are the target. Some scientists postulate that RBD’s potential neurodegeneration may be linked to Parkinson’s or even an earlier expression of the same disorder, though more research needs to be done regarding this potential connection. Underactivity in the REM sleep circuit is clearly detrimental to a sleeper. An overactive REM circuit, one that causes muscle paralysis at inappropriate times, can also cause a disturbing and sleep-disrupting parasomnia. Sleep paralysis (SP) is a terrifying disorder where the sleeper becomes conscious, but is still unable to move except for the eyes and diaphragm(13). Here, SubC neurons are likely again doing a sloppy job; the neurons either preemptively turn on muscle paralysis as the person is getting drowsy (“hypnagogic SP”), or are turning off REM’s unconscious, dreaming state but leaving the muscle paralysis switched on as the person wakes up (“hypnopompic SP”)(14). For reasons still unknown, SP sufferers typically have hallucinations and extreme fear of an attacker while they are immobile (“intruder” symptoms), have difficulty breathing (“incubus” symptoms) and/or have out-of-body experiences (“unusual bodily experience” symptoms)(13). Though symptoms usually cease within minutes of the SP attack (some SP episodes can last for hours, truly the stuff of nightmares), attacks are often frequent and frightening enough to keep those affected from adequate sleep. 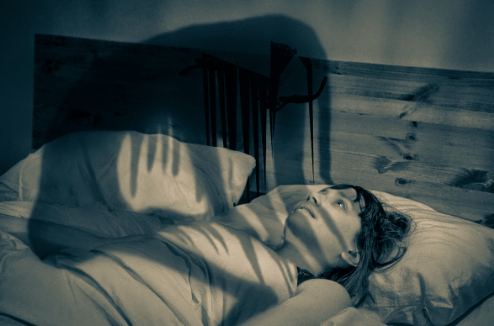 Sleep paralysis sufferers usually hallucinate or feel threatened while they are helplessly immobile. What an awful combination. Not much is known about what causes level of consciousness and muscle control to be out of sync in SP. In 1992, Takeuchi and colleagues used EEG to analyze the brain activity of patients actually experiencing an SP attack, and saw bursts of beta waves (a type of brain wave, which are synchronized fluctuations in the brain’s electrical activity) as the patient was mid-attack; these speedy brain waves are abnormal for both REM or recent waking, and denote an extremely attentive state. These out-of-place waves may indicate that not only is muscle control slow to recover in SP, but also that coming to consciousness is sped up and/or enhanced by beta wave intrusion. Sleep paralysis is, like RBD, closely linked to Parkinson’s, as PD sufferers often have comorbid sleep paralysis(16). Why neurodegeneration would be linked to SP is less clear than the link to RBD, however. Probably the largest and most mysterious area of SP research centers on the strangeness of its emotional and hallucinatory symptoms, although so far scientists have more theories than data about neurobiological causes. What we do know is that REM sleep paralysis, precisely timed and of correct strength, is important. With it, we sleep soundly at night. Without it, we get parasomnias, leaving us thrashing around in our sleep or lying awake and trapped. I’m gonna go hug my teddy bear. 2) Dauvilliers Y, Siegel JM, Lopez R, Torontali ZA, John H. Peever JH (2014). Cataplexy—clinical aspects, pathophysiology and management strategy. 3) Fraigne JJ, Torontali ZA, Snow MB, Peever JH (2015). REM Sleep at its Core -Circuits, Neurotransmitters, and Pathophysiology. Front Neurol. 29;6:123. Figure 2. 1) Orzeł-Gryglewska, J (2010). Consequences of sleep deprivation. Int. J. Occup. Med. Environ. Health 23, 95–114. 2) Diekelmann, S. & Born, J. (2010).The memory function of sleep. Nat. Rev. Neurosci. 11, 114–26. 7) Fraigne JJ, Torontali ZA, Snow MB, Peever JH (2015). REM Sleep at its Core – Circuits, Neurotransmitters, and Pathophysiology. Front Neurol. 29;6:123. 10) Brooks PL, Peever JH. (2011) Impaired GABA and glycine transmission triggers cardinal features of rapid eye movement sleep behavior disorder in mice. J Neurosci. 31(19):7111-21. 12) Aldrich M. (1994). Parkinsonism. In Principles and practice of sleep medicine. Philadelphia: WB Saunders Co, 783789. 14) Cheyne JA, Rueffer SD, Newby-Clark (1999). Hypnagogic and Hypnopompic Hallucinations during Sleep Paralysis: Neurological and Cultural Construction of the Night-Mare. Conscious Cogn. 8(3):319-37. 15) Takeuchi T, Miyasita A, Sasaki Y, Inugami M, Fukuda K. (1992). Isolated sleep paralysis elicited by sleep interruption. Sleep. 15(3):217-25. I get (mild?) hypnagogic sleep paralysis from time to time (it seems to correlate with REM deficit; I experience it in the morning after waking up briefly before falling back asleep or if I’m very sleep-deprived and try to take a mid-afternoon nap). My experiences are not accompanied by any of the really scary visual hallucinations – never seen The Crusher or anything like that. The episodes are typically brief (maybe 5-10 seconds), though several can occur in succession if I can’t successfully wake up after the first. They begin with a sense of very groggy wakefulness followed by the onset of paralysis. This, by the way, is terrifying. It feels like your body is going dark, maybe? It’s also accompanied by a full-body hot flushing sensation that isn’t unlike what you would feel in an extremely emotionally-intense situation, except you can’t move so it’s the only thing to pay attention to. Sometimes this sensation goes through me in waves. If I try to do nothing and just let it happen at this point the fear subsides and I generally wake up shortly thereafter. Alternatively, the fear subsides and I imagine that I wake up, but don’t actually wake up, and then begin dreaming that I am paralyzed or in danger of suffocating (more terror), and this will loop for a while. I can also be awake enough that I actively try to move to get out of it. This the first thing I did when I first experienced this as a kid (I woke up, then became paralyzed and fell face first onto my mattress. Convinced I was going to suffocate I screamed at myself to wake up in my head while trying to push up with my arms – eventually I woke up suddenly and did in fact push myself up. No clue if I was actually in danger or if the sensation of suffocation was invented by my brain to explain the fear). Trying to move while paralyzed – even though for me this is only a few seconds usually – will ramp the fear up tremendously. Once I learned what this is, it no longer bothers me as much. I recognize it instantly and know what to do to minimize the fear that it will happen again (after waking up, roll over to my back and push pillows away so that nothing is near my face to smother me). Nowadays it’s more likely to trigger anger (“Not this again!”) and annoyance. The fear is still there but dissociated. I can also watch it happen. For instance, I was convinced the first few times that I couldn’t breathe until I noticed that, in fact, I was breathing. And on one occasion I experienced a bout of actual rapid eye movement while still otherwise conscious and I consider that kind of a privilege really. It was super-cool.